By the way, I have many friends who work at United Way. They are exceptionally professional individuals and nothing I say here is a personal indictment of them or anyone else. My purpose is not to disparage United Way or to marginalize its role in the community. Rather, this is my assessment of what the American Red Cross and other such organizations must do when forced to search for “cheese” in new corridors within the maze. I believe major funding cuts from United Way can provide defining, watershed moments for progressive organizations. 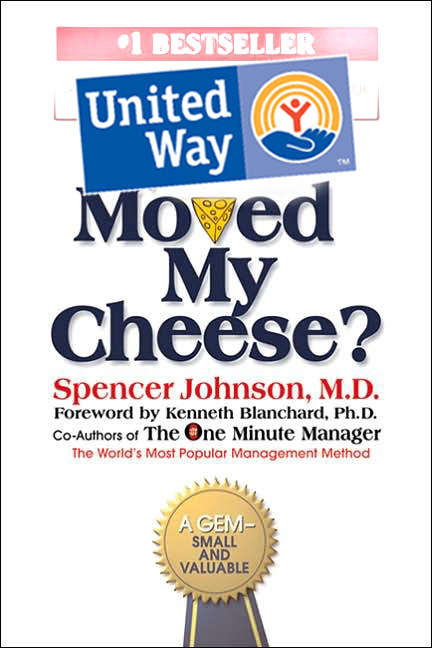 When compelled to find new sources of “cheese” these organizations will reduce their long-standing dependency upon United Way as a funding partner. Such changes can ultimately strengthen the American Red Cross and other nonprofit agencies as they regain more control over their own destinies. So what are the first steps in recovering from a sudden and unexpected change of plans? Let’s briefly look at each question, applying it to whatever changes you may be encountering in your life. To think clearly, you first must remove emotion from your assessment. Look objectively at what has happened. Ask lots of questions, analyze data and study the trends. If essential information is missing, find ways to acquire the needed information. 2. What impact with this have? Evaluate the impact of your changing circumstances. No matter what, never let something distract you from fulfilling your mission. Organizations and individuals alike must determine how they can best stay focused when unexpected change happens. You’ll likely have fewer resources to work with and adjustments will be inevitable. But never allow that to become an excuse for backing away from your purpose or mission. After you know what happened, and once you understand the impact, it time to make a plan and take action. Often it’s helpful to convene a group of diverse stakeholders who can brainstorm ideas from a variety of vantage points. A well-facilitated planning process can produce ideas that a visionary leader can then use as the basis for a plan of action. One thing is certain—the future will not be an extension of the past. Change happens. Someone moved our cheese. So what are we going to do about it? The American Red Cross has an important work to do in the community. Much is at stake and we have some crucial decisions to make. I trust that we will respond with an abundance mentality rather than with a fearful scarcity mindset. I hope to be part of creating the long-term solutions that will help the American Red Cross continue doing what it does best—with or without United Way. I’ll close with a favorite quote from the renowned architect Frank Lloyd Wright. The human race built most nobly when limitations were greatest and, therefore, when most was required of imagination in order to build at all. This entry was posted on Wednesday, January 6th, 2010 at 12:30 pm and is filed under Life's Transitions, Marketing & Strategy. You can follow any responses to this entry through the RSS 2.0 feed. You can leave a response, or trackback from your own site. Very insightful! Your advice on how to best deal with change is right on (and applicable to both personal and professional situations.) Given the current economic climate, no organization (or individual) is exempt from the possibility of change. As you so eloquently highlighted, the challenge is continuing to move forward toward your mission or goal, in the face of adversity. In my mind, the silver lining is that being faced with this challenge now (and effectively rising to meet the challenge) will only serve to make you/your organization stronger in the end. Thanks for the timely and relevant post! Meggan, when unforeseen things in life happen we have choices to make. Stephen Covey tells us that the very first habit of highly effective people is being proactive. In other words, effective people (and organizations) take control of what is within their sphere of influence, never surrendering their destiny to anyone else. To survive and succeed, individuals and organizations must be proactive in these chaotic and turbulent times. Thanks for your comment. I enjoy reading your blog posts. As the new CEO of America’s Charities (www.charities.org) and a former Red Cross NHQ fundraising executive as well as United Way of America fundraising exec, I can tell you that Red Cross has been missing the boat for many years in terms of workplace employee giving. There’s a host of progressive private sector employers who, through America’s Charities, are providing their employees with more choice and more inclusive campaigns. As United Ways have moved into new forms of fundraising which, ironically, compete with Red Cross and other direct service charities, they’ve lost 4 million workplace donors which translates into over $1 billion in lost funds. We see that as an opportunity for our national member charities to re-energize workplace giving and employee engagement. And we see evidence that workplace giving is the most resilient, most sustainable form of giving with results holding strong during the most horrendous economic climate the country has seen since the Great Depression. Red Cross would be an ideal partner for us with great mutual benefits derived. Congratulations, Steve, on your new position. I’ve known of America’s Charities for several years, though I’ve never worked directly with anyone from your organization. As I’m sure you know from your work with the American Red Cross, several Chapters have already left United Way because of United Way’s ever-changing priorities. They have looked for various other options to replace the lost revenue and some have established various workplace campaigns that compete directly with United Way. I remember when I first went to United Way in the mid-1990s. I was surprised to hear some United Way leaders define their competition as the Red Cross and other nonprofit agencies which were strong partners of United Way. Sadly, because of United Way’s own actions, those partner organizations have been forced to become very formidable competitors of United Way. That dynamic creates some very interesting marketing opportunities for America’s Charities and other federated fundraising campaigns. Good luck in your new role, and thanks for engaging in the conversation here on my blog. I say Bulls-eye Duane! As a long time volunteer in a Red Cross Chapter and leadership position, the ever-changing direction of UW has been a challenge in budgeting for a local ARC Chapter, one even actively involved in United Way fundraising and we as Red Cross (National) have missed to boat in not promoting more work place giving as many chapters are already in the workplaces teaching and supporting health and safety classes, blood donation programs and the like. The ARC National has had it’s head in the sand too long as a partner with workplace fundraising. They, just like United Way of the past, has been way top-heavy with administrative junk and as both writers have espoused we need the American Red Cross, more than ever to be present in our local areas providing community programs and support. ARC National has had multiple RIF’s and structure changes in the recent past, and even auctioned much or our history and memorabilia to help close a huge financial deficit. As more and more agencies aligned with Community Chest/United Way, the piece of the pie has kept decreasing and only those local chapters who moved from UW funding support or had aggressive financial development and on-going fund raising programs (often in violation of UW agreements) find themselves with any firmer financial foothold during this economic down turn. That being said, this December was the BEST local donation month our chapter has experienced in years. Congratulations, Keith, on your chapter’s fundraising success in December. If I’m not mistaken, you are the chair of your Red Cross board. Fundraising success can always be attributed, in part, to strong board leadership. Being relatively new to the Red Cross, I’m surprised that our national system has not done more to create options or at least to stimulate conversations about how we move forward without United Way’s help. To me, it seems that each local market is left to develop its own strategy. Granted, each United Way relationship is different in some way, but there are common themes. We should be learning from each other and demonstrating our strength as a system. Thanks for your comment, Keith, and thanks for your volunteer leadership within the Red Cross movement. Your goal is not to disparage the United Way? Why not? If any organization was deserving of disparagement, it’s UW. Not only does it now de-list the Red Cross from workplace campaigns, it actively lobbies employers not to include Red Cross (or any other charity) on their own recognizance. UW has not only moved your cheese, it has eaten it and taken steps to ensure you never see cheese again. If the Red Cross thinks it is unseemly to fight back, then the Red Cross will allow itself to be marginalized out of the workplace giving sector.